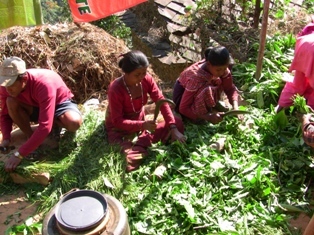 Coffee production practices in Nepal is , Natural, Eco- friendly and grown under shade Trees above 1000 meters altitude. Major plantations are in the virgin soil of forest. It is thus, by default organic. Hand-picked at different intervals with special selection of cherry are dried on the sun for natural coffee (dry Processing) and pulped right after harvesting with pulper for wet Processing with necessary additional procedure More than 90 percent of the coffee is wet processed. This company has a social relation with coffee growers providing coffee production technologies with necessary technical and materials support. Farm level processing is being done at group level in a cooperative concept for which the company has provided necessary tools and equipments with buy back guarantee for the quality products. Our coffee offers you best aroma with nuts flavors, good body, balance acidity and unique shiny creama. For your complete satisfaction we serve you 3 different types of roasting beans and ground coffee. Light roasted who likes light taste, high acidity, Medium roasted prepare for mild strong taste and high flavor. it gives you nice body and aroma. It’s good for espresso to see golden creama. Dark roasted coffee prepared for strong coffee lover and you can enjoy cold or ice coffee too. Recently we launched a cup of dripping coffee bag which you can use anywhere, everywhere when you desire to ship a cup of coffee. For your complete satisfaction we used hygienic and healthy filter paper and aluminum pouch to save its Himalayan flavor and aroma. Supply capacity: There are possibilities of increase volume if you confirm the order during the harvest. Packaging size: Green beans coffee packed in 30 kgs new jute bag which is international standard. Roasted Beans and ground coffee are available at 250 grams and 500 grams in aluminum pouch. Mount Everest Organic Coffee Pvt. Ltd.